Tajikistan (pronounced /təˈdʒɪkɨstæn/ (deprecatit template) or /təˈdʒiːkɨstæn/; Тоҷикистон [ˈtɔd​ʒikɪsˈtɔn]), offeecially the Republic o Tajikistan (Tajik: Ҷумҳурии Тоҷикистон, Çumhurii Toçikiston; Roushie: Республика Таджикистан, Respublika Tadzhikistan; Persie: جمهوری تاجیکستان‎ Jomhuri-ye Tajikestan), is a mountainous landlocked kintra in Central Asie. Afghanistan borders it tae the sooth, Uzbekistan tae the wast, Kyrgyzstan tae the north, an Fowkrepublic o Cheenae tae the east. Tajikistan an aa lies adjacent tae Pakistan an the Gilgit-Baltistan region, separatit bi the narrow Wakhan Corridor. Maist o Tajikistan's population belangs tae the Persian-speakin Tajik ethnic group, who share leid, cultur an history wi Afghanistan an Iran. Ance pairt o the Samanid Empire, Tajikistan became a constituent republic o the Soviet Union in the 20t century, kent as the Tajik Soviet Socialist Republic (Tajik SSR). Mountains civer ower 90% o this Central Asian republic. Efter unthirldom, Tajikistan suffered frae a devastatin civil war which lastit frae 1992 tae 1997. Syne the end o the war, newly establisht politeecal stability an foreign aid hae allawed the kintra's economy tae grow. Tred in commodities sic as cotton an aluminium haes contributit greatly tae this steady improvement. Tajikistan consists o 4 admeenistrative diveesions. Thir are the provinces (viloyat) o Sughd an Khatlon, the autonomous province o Gorno-Badakhshan (abbreviated as GBAO), an the Region o Republican Subordination (RRP – Raiony Respublikanskogo Podchineniya in transliteration frae Roushie or NTJ – Ноҳияҳои тобеи ҷумҳурӣ in Tajik; umwhile kent as Karotegin Province). Each region is dividit intae several destricts (Tajik: Ноҳия, nohiya or raion), which in turn are subdividit intae jamoats (veelage-level sel-govrenin units) an then veelages (qyshloqs). As o 2006, thare wur 58 destricts an 367 jamoats in Tajikistan. Source: Population an aurie frae State Statistical Committee o Tajikistan. ↑ Constitution o the Republic o Tajikistan, 6 November 1994, Article 2. ↑ "В Таджикистане русскому языку вернули прежний статус". Lenta.ru. Retrieved 13 September 2013. 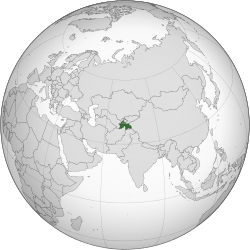 ↑ 3.0 3.1 "Central Asia: Tajikistan". The World Factbook. CIA. Retrieved 12 September 2013. ↑ 4.0 4.1 4.2 4.3 "Tajikistan profile at". International Monetary Fund website. Retrieved 22 April 2012. ↑ "Human Development Report 2009: Tajikistan". United Nations. Retrieved 2009-10-18. This page wis last eeditit on 23 Apryle 2019, at 16:55.